Bank of England policy makers raised interest rates for the first time in a decade, yet expressed concern for Britain’s Brexit-dented economy by indicating that another increase isn’t imminent. Led by Governor Mark Carney, the Monetary Policy Committee voted 7-2 on Thursday to increase the benchmark rate to 0.5 percent from 0.25 percent. The minutes of their meeting underscored worries that the economy is fragile as the 2019 split with the European Union nears. Crucially, policy makers omitted language from previous statements saying that more hikes could be needed than financial markets expect. That implies that officials are comfortable with pricing for two more quarter-point increases, roughly one by late next year and another in 2020. 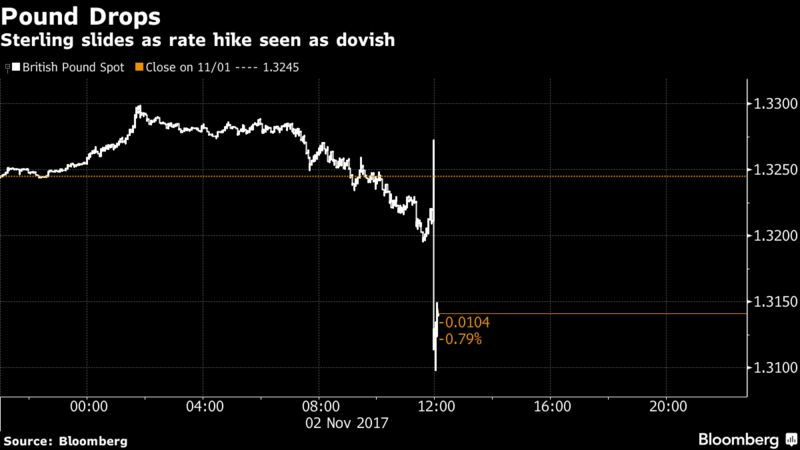 The more dovish outlook than investors anticipated pushed the pound down nearly 1 percent against the dollar to as low $1.3096 and gilts rose. U.K. money markets pushed back expectations for the next shift to September 2018 from August 2018 previously. Thursday’s decision removes the emergency stimulus introduced in the wake of last year’s EU referendum. 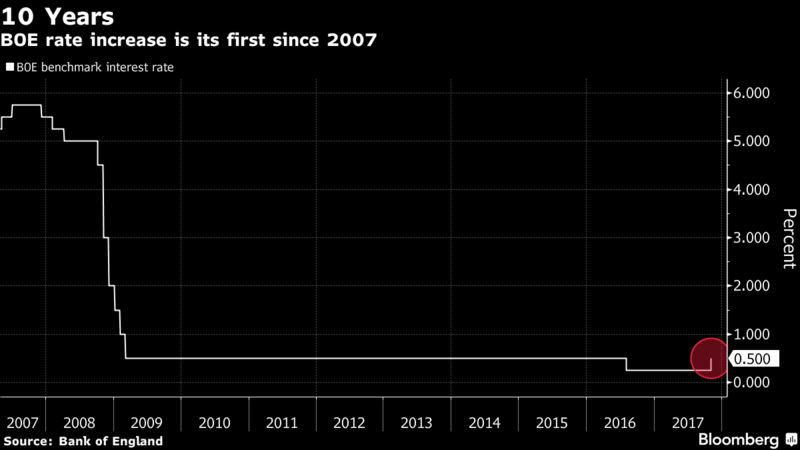 It will push against the fastest inflation in five years, boosted by a weaker currency and the lowest unemployment rate in four decades. Inflation is now running a full percentage point above the bank’s 2 percent target. The dilemma for the central bankers is that underlying price pressures aren’t stemming from stronger demand, but flaws in the economy aggravated by Brexit, namely weak productivity. The bank kept its forecasts for growth and inflation broadly unchanged and sees price gains at 2.2 percent in three years, slightly above its goal. The estimates are based on market projections for the key interest rate reaching 1 percent over that period. The bank kept its bond programs unchanged and reiterated that any future interest-rate increases will be limited and gradual. The forecasts were accompanied by a gloomy section that there are “considerable risks” to the outlook. Brexit featured prominently in the warning, with policy makers saying they’re ready to respond if it affects households, businesses and inflation. For the doves on the committee, Jon Cunliffe and Dave Ramsden, there was little sign of domestic costs and wages picking up and they saw a chance slack was greater than estimated. But for the majority, the erosion of slack and continued economic momentum justified action. The rate increase will hit mortgage holders, a fifth of whom have never experienced a BOE rate hike, according to the bank’s estimates. The effect will be gradual overall because so many borrowers are tied to fixed rates, it said. The decision to hike comes after multiple false alarms from Carney since he took over as governor in 2013, most notably in 2014 when his whipsawing of investors led to him being tagged an “unreliable boyfriend.” Carney talks to reporters at a press conference at 12:30 p.m. London time. The BOE’s forecasts see relatively steady growth over the next three years — about 1.7 percent — but it’s far below the pre- crisis average of 2.9 percent. To put the MPC’s dilemma in context, never in its 20 years of independence has it tightened when GDP data was so weak. At 0.4 percent in the third quarter, it was a 19th consecutive expansion, but below the average of the past five years. The economy performed better than the bank forecast in the wake of the Brexit vote in 2016, but leaving the EU remains clouded in political uncertainty. There is little insight yet into what form the split will take, let alone Britain’s future relationship with its biggest trading partner. The big risk is the final deal chills foreign investment, hurts commerce and closes off a supply of vital labor. Such weaknesses would consign a lower “speed limit” on the economy, with repercussions for incomes, demand and inflation. The BOE’s step into tightening territory sets it on a path already well-trodden by the Federal Reserve, although it’s responding to economic strength. After a meeting at the U.S. central bank this week, officials signaled they remain on track to hike for a third time this year in December. The U.S. economy is forecast to expand 2.2 percent this year, outpacing the U.K.